Possibly Unique St. Louis Post Office Pink Paper Postmarked 6 Cents Scrip: The postmasters of St. Louis issued the first printed currency notes in 1816. Aaron Crane issued two series of notes during his brief tenure as postmaster. The earliest series printed on pink paper is extremely rare and this six-cents is not only an odd denomination, but it is surcharged with a straight-line (as opposed to circular) postmark. Superb T. R. Livingston French Point 1862 $1.25 Scrip Payable in the Cherokee Nation: Most private scrip, both from the North and the South, was created during the Civil War. Confederate-influenced scrip from Missouri is rare due the instability of the relatively few towns and small geographical area controlled, primarily in the southwest corner of the state. Some notes were issued from one location but payable at another, where the Confederate Army was in a stronger position. The T. R. Livingston notes, payable in the adjacent Cherokee Nation, are an example of this type of issue. 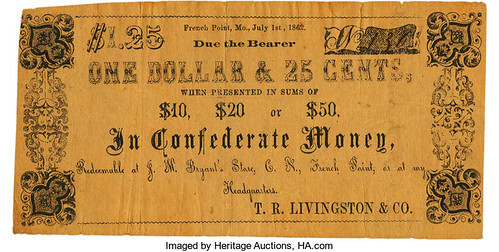 This $1.25 note is payable “In Confederate Money” and one of the finest example known. High-Grade and Stylish Scotia Iron Works $5 Note: Despite being prohibited by federal law, scrip notes continued to be issued after the Civil War. They were often essential for companies to pay workers or to float debt during financial panics, such as that of 1873. Iron mining was a significant Missouri industry, and several mines issued paper scrip notes. The five notes from the Scotia Iron Works Store in this sale are, to our knowledge, published and cataloged for auction for the first time. This $5, 1872-dated note has a Federal eagle at the upper left and has the appearance of an official government-issued note. It may be a unique example. Highest Denomination St. Louis Omnibus Co. $3 Iowa Tie Note-Ex Wismer: Some privately issued notes were tied to other locations, either to be deceptive, skirt legal restrictions, or make redemption of legitimate notes more convenient. Eric classified these “tie” notes together in his collection, and they are grouped together in the catalog. Perhaps the most intriguing issue is the St. Louis Omnibus Co., with the title very dominant across the center. Eric specifically requested the three denominations in 1939 from D. C. Wismer after seeing them in an advertisement in The Numismatist. Although the series is payable in Belleview, Iowa, this is technically a New York City issuer. Extremely Rare 1887 National Indian Ball Game Ad Note: Advertising notes are not necessarily scrip, though sometimes they were redeemable for discount. Eric has several interesting ad notes, and his grandfather issued advertising notes printed on the back of Missouri Defence Bonds (retained by the family). One of the most intriguing American advertising notes is the very rare 1887 National Indian Ball Game type with portraits of actual Native American baseball players on the color back. The notes were issued by Thos. Ward of St. Louis for the games played at Sportsman's Park. We know of only one other example. Bidding will close soon, and we wouldn’t want you to miss out on these wonderful Newman Collection notes. Please visit HA.com/3547 .